The week after my semester ended I spent surrounded by US Navy and Military personnel. That itself was quite an experience, but not the most interesting part. By joining the CROSSMobile research team I got the unique opportunity to attend JIFX, a “hackerspace for private industry, academia, DoD, and humanitarians”. Attending this was one of the most unexpected experiences and it felt a bit surreal. But it was a great and a lot of fun. The research team focuses on technologies around cellular networks (mobile phone networks). To do this properly, they built their own network. The coolest part is that one of the antennas for this network is literally mobile. 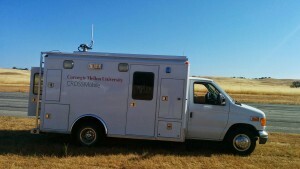 The team bought a retired ambulance from the Fire Department of LA and mounted an antenna on top of it as well as equipped it with a full stack of servers and other network components. Measuring the signal strength of one such antenna is not an easy task – especially in three dimensions. One way to do it is by flying drones – or UAVs (Unmanned aerial vehicles) as I got corrected a couple of times this week. These drones are manually assembled and manufactured with many parts printed by the 3D printer on campus. 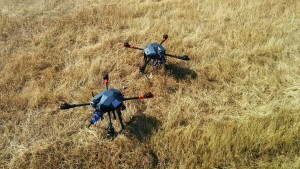 The two quadcopter drones without the rotors. 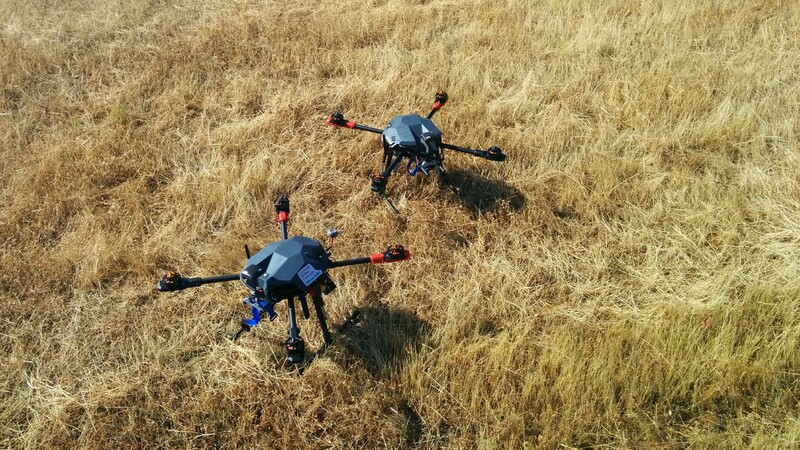 Flying UAVs commercially is not yet allowed in the US, and this is where JIFX comes in. JIFX takes place on the military base Camp Roberts and thus is in restricted airspace where flying such drones can be allowed. Organizations from all over the region come to JIFX to conduct experiments. These organizations come from the industry, academia or the NGO space. Some of the technologies are obviously designed for a combat scenario and this alone sparked some interesting discussions in regards on how comfortable we feel when software is used in a war zone. But this aside, we were more interested in civilian applications. Our goal was to map out the signal strength of the antenna on top of the CROSSMobile mast with the drones. The drones would fly autonomous once a mission is programmed and uploaded. The end goal is to take this data and feed it into a machine-learning algorithm that could then predict the signal strength of antennas based on a terrain model. This would massively simplify the planning of cellular networks. For more information on the experiment itself, feel free to read our mission description. 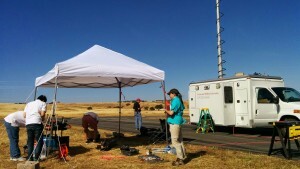 Setup on the airfield. Here the van with extended antenna. Now, I have very little clue about these things. I am not a network specialist and usually stay away from hardware related things. But turns out the team could really use a software guy and was interested in doing more work with the team. What they needed was real-time visualization of the collected data. The drone would send the telemetry data in a frequency of 2 Hz to the van and post it to my webserver. Now this might not sound like such a big challenge. The challenge comes with the time frame as I joined the team essentially a week before we left for JIFX and this week also happened to be finals week. While I had a rough prototype in place when we left for the event, it was nowhere near production ready. 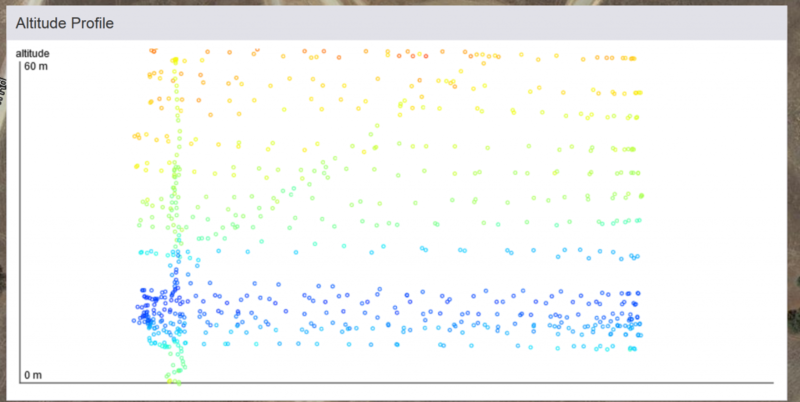 Screenshot of my data visualization tool. Aggregation of data points on 5 x 5 sqft. The unique thing about JIFX is its rapid development speed that is practiced there. People from completely different teams would come together on Monday and have an idea on how to collaborate. They would start implementing it the next day and run experiments on Wednesday. All this on the field. And this culture is lived by every team including ours. While two members of our team built a new mount for a new antenna outside I was implementing new features for the data visualization tool inside the van. Thinking about short iterations in software developments? We practiced development cycles of a couple of hours. This felt a bit like the hackathons that are practiced in the Silicon Valley – just that this time it was not for a competition but for real field experiments. Every minute the software as not ready meant that we would not be able to fly the drone and air time was sparse. This was probably the most stressful environment I ever coded in. I was mentally exhausted every evening but we still had some drone repairs to do – so we would fire up the soldering station on the parking lot of the hotel. In the end it worked out. We got meaningful data, we showed it off to other participants of JIFX and they all seemed pretty excited. That was also the first time I had to show off my software to US marines.